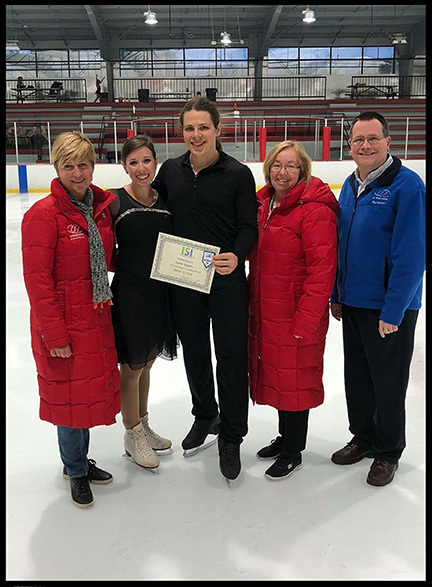 Above: Caleb Rogers (center) poses with Judge Margy Bennett (to his left) and partner and coach Devon Harman Renfro (to his right) and other ISI officials soon after passing ISI Dance 10 -- Summer of 2018. 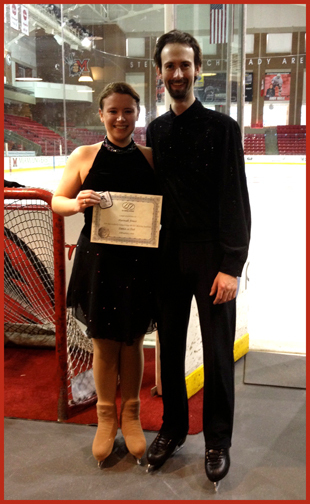 Above: Alex Bernard (left) poses with partner Ashley Deavers soon after passing ISI Dance 10 during the ISI Winter Classic in Orlando, Florida -- February, 2016. 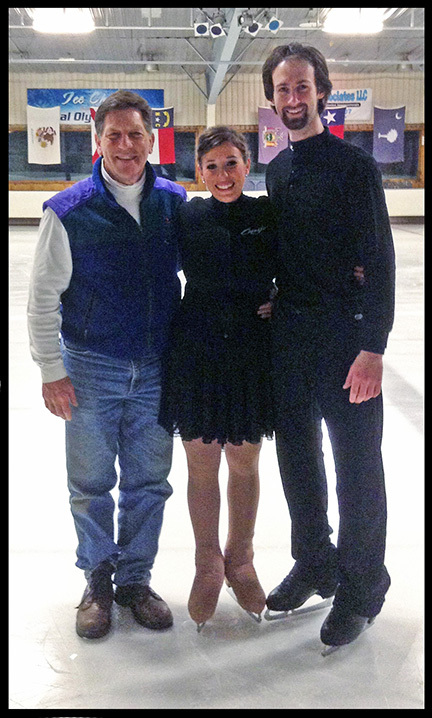 Above: Devon Harman Renfro (center) poses with coach Larry LaBorde (L) and partner Ashley Deavers (R) soon after passing ISI Dance 10 in 2013. 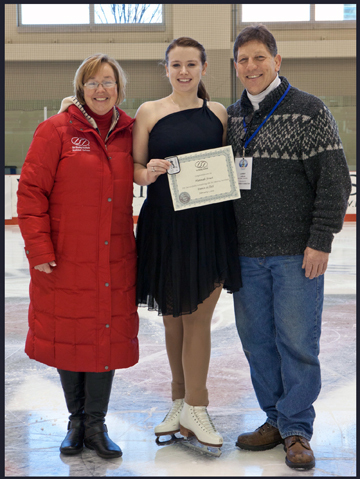 Above: Hannah Foust (center) poses with Judge Margy Bennett (L) and coach Larry LaBorde (R) soon after passing ISI Dance 10 during the ISI Winter Classic in Oxford, Ohio -- February 7, 2013. In July of 2007, Jessica Marshall reached the peak of the ISI Ice Dancing world, passing the Ice Skating Institute's Dance 10 level in Chicago, Illinois during the ISI's World Recreational Team Championships. Jessica has been skating since she was a tot at the tender age of three and performing since 1989. She is also a teacher at the Ice Chalet. She was awarded the Ice Skating Institutes ISIA Scholarship in 2004. Jessica is also a ballroom dancer! 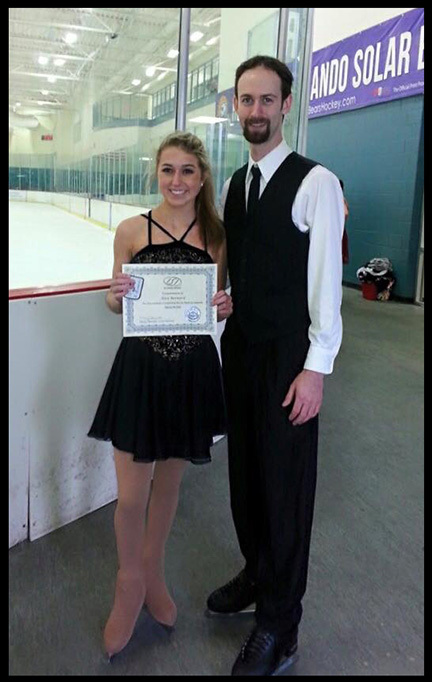 First Robert Unger Skater Under Age 16 To Pass ISI Dance 10! 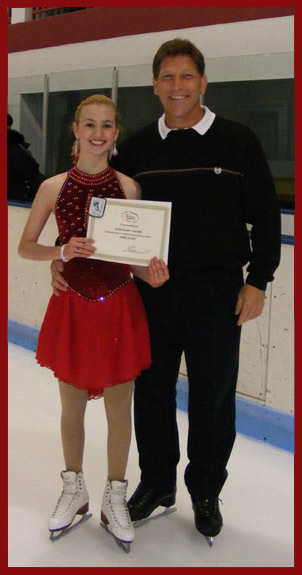 In May 2007, Kassandra Hazard became the first skater in the history of the Ice Chalet to pass the Ice Skating Institute's Dance 10 before she reached the age of 16 (she was 15 at the time). She joins a distinguished list of skaters from the Ice Chalet who have achieved this high level of ice dance recognition, but her accomplishment is all the more amazing considering the fact that she only began skating four years ago. Larry LaBorde partnered her through every dance, including the last one that she saved for him when they met for the test during the ISI convention in Minnesota. Kassie also earned her Gold Medal in Ice Dancing in the United States Figure Skating system in April, and she passed her USFS Senior Moves in the Field in January 2007. Kassie had a very successful competition year in 2006-07 with her previous partner, Benjamin Nykiel of Maryland. They won the bronze medal in Intermediate Dance at the 2007 Junior National competition and the silver medal at the 2007 South Atlantic Regionals. She began apprenticing as a teacher at the Ice Chalet in the Summer of 2007 so that she can pass on her love of ice dancing to the next generation. She also continues to improve her own skating, and is already learning to master many of the international level dances. These skaters join a distinguished list of skaters from the Ice Chalet who have achieved this high level of ice dance recognition, earned with hard work over many years growing up in the Robert Unger & Larry LaBorde School of Ice Skating.